28 years, 7 months, 17 days old age. 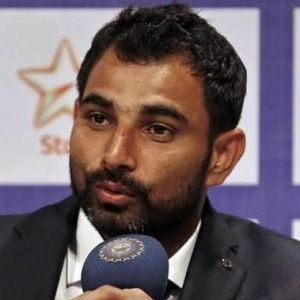 Mohammed Shami will turn 29 on 03 September, 2019. Only 4 months, 13 days, 11 hours, 20 minutes has left for his next birthday. Mohammed Shami has celebrated the total number of 28 birthdays till date. See the analysis by days count and bar graph. Mohammed Shami was born on 03-09-1990 in Amroha in the state of Uttar Pradesh, India. He is an Indian Cricket Player. Shami hails from Uttar Pradesh but plays first-class cricket for Bengal from where he was noticed. He had played only 15 first-class and 15 List A games when he was drafted into India's ODI team to play Pakistan in Delhi in January 2013. He showed the faith wasn't misplaced and returned figures of 9-4-23-1 in a 10-run win, thus becoming only the eighth bowler, and the first Indian, to bowl four or more maiden overs on his ODI debut. His Test debut, which happened in November that year against the touring West Indies, was even more spectacular. He reverse-swung the old ball appreciably, and at a good pace, in the two-match series to take 11 wickets at 16.54. In the summer that followed in England, Shami and Bhuvneshwar Kumar, recorded the second-highest 10th wicket partnership for India in Tests, when they put on 111 runs against England in Nottingham. He had a great outing in 2018 and that saw the return of Shami 2.0. He got his line and length right back on track and has made an exceptional comeback to the ODI side. After warming the bench because of the presence of Jasprit Bumrah and Bhuvneshwar Kumar. He is arguably now Virat Kohli's first choice fast bowler. He has also enjoyed early success in the Twenty20 format, picking up 14 wickets in his first eight domestic T20 games in 2011, and was signed by Kolkata Knight Riders for the 2011 IPL season. He then went to Delhi Capitals and played 3 seasons for them. He was then roped in by IPL franchise Kings XI Punjab for INR 4.8 crores in IPL player auction 2019. He was born to Late Tousif Ali and Anjum Ara. He was married to Hasin Jahan from 2014 to 2018. Together the couple was blessed with a daughter named Aaira Shami. He was first spotted by former cricketer Debabrata Das and started his career by playing for Town Club in Kolkata. He has no place to stay in Kolkata and therefore, he stayed at Debabrata Das residence during his initial years. He is the fastest Indian to take 100 wickets in ODI's. He achieved this feat in 56 ODI's. When he first played for India, he was credited as Shami Ahmed but later it was revealed that his actual name is Mohammed Shami. He divorced his wife Hasin Jahan after an ugly spat which became public.